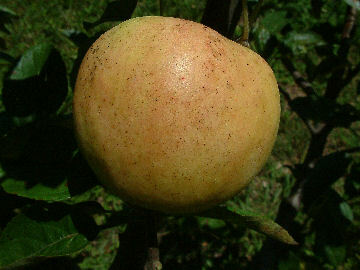 This is a very old American apple having originated in the Plymouth Colony in the 1600’s and was first recorded in 1822. The “hightop” description probably refers to the tree’s tendency to form the first scaffold branches high up on the trunk. Fruit is small to medium with smooth greenish-yellow skin with an occasional red blush. The yellow flesh is tender, dry, and very sweet. Ripens June to July in most areas.